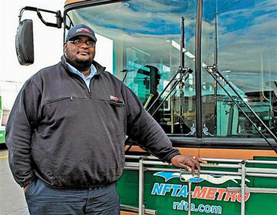 About 20 McKinley High School students had just stepped aboard Darnell Barton’s Metro bus Oct. 18 when he spotted a woman who had climbed over a guardrail and stood leaning over the afternoon traffic zipping along the Scajaquada Expressway below. With cars and an occasional pedestrian continuing to pass by her, Barton wasn’t sure at first that the woman was in distress. With the woman in a bear hug, Barton asked if she wanted to come back over the rail. She hadn’t spoken up to that point but said yes. “Then she said, ‘You smell good,’” he said. A corrections officer and a female driver who’d been behind the bus came to help, speaking to the woman until police and an ambulance arrived. When the ambulance drove away, Barton got back on his bus —and received a standing ovation from the high school students and other passengers who’d been watching through the windows. He finished his route, wrote up a report and went home. Barton wishes he could speak with the woman again to make sure she’s OK.
“Things like this put what’s important in perspective,” he said. “You hug your kids a little tighter, kiss your wife a little bit longer. You’re grateful.